Founded by two Danish entrepreneurs in 2002, Bullguard is certainly one of the lesser known antiviruses out there. Despite not being as known as the big hitters, however, it still manages to provide a decent level of service thanks mainly to its powerful antivirus engine, which is based primarily on BitDefender. We recommend Bullguard Antivirus as a good choice for those seeking basic reliable protection against security threats without adding many unnecessary additions. Bullguard antivirus is a London-based antivirus provider that has been in the game since 2002. Although it has garnered relatively little recognition compared to major brands, it is nonetheless a very worthwhile tool for those with modest PC security needs. This Bullguard antivirus review will test how well the solution will perform for the average user. Should You Choose Bullguard Antivirus Software? Bullguard is a respectable choice for antivirus protection. It’s program is easy to use and very well designed, and offers full scans of your computer. While it does not offer the same level of protection as other antivirus software options, it does offer all the basic services you need, including email scans and firewall protection, which we’ve tested and found to be top-notch, for your personal computer. The good news for those hunting for a bargain is that Bullguard Free exists in the form of Free Bulguard Mobile Security, although the product is currently only available for Android users, meaning that Windows and Mac users will have to shell out some cash to get protection. 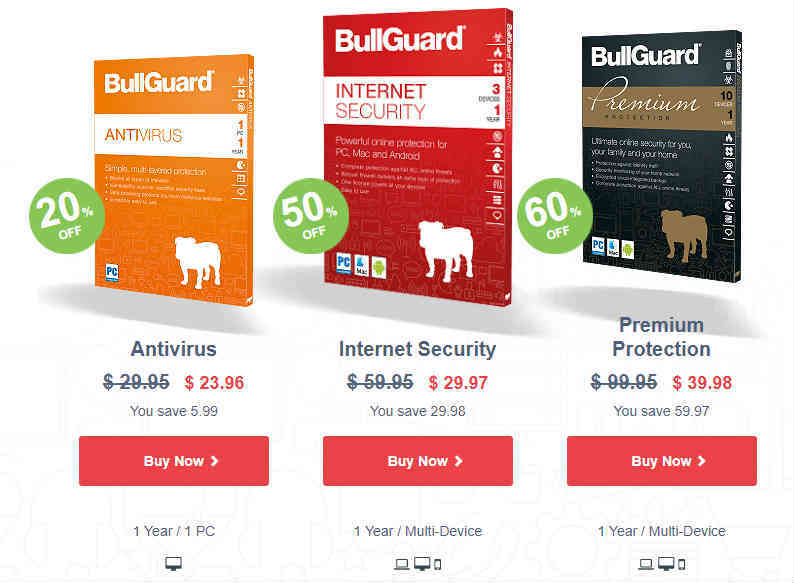 These users have three options to choose from: the basic BullGuard Antivirus (Windows only) is available at a one year subscription of $23.96, covering one computer; BullGuard Internet Security (Windows/Mac/Android) is available at $29.97 per year, which covers three computers; and Bullguard Premium Protection (Windows/Mac/Android) is available for $39.98 for a 1 year subscription, which covers up to 10 devices. All products are offered as free 15 day trials and include 30 day money-back guarantees. Please note that all these prices are exclusive to Secure Thoughts. Internet Security and Premium Protection customers can avail of 24/7 support, firewall, parental control, and PC tune up – none of which are available in the basic premium package (Antivirus). Only Premium Protection features identity protection and a home network scanner. Our thoughts: for basic protection, the solution is cheaper than many alternatives on the market, although the fact that the license only covers one computer makes it less enticing for those with multiple computers in the home. The two multi-device products – Internet Security and Premium Protection – are less competitive offerings. The malware protection that the company offers is generally regarded as robust and that opinion was borne out during our test run: attempts to force the engine to stop running were unsuccessful (this is, of course, a good thing). The malware detection engine uses BitDefender signature matching and heuristic monitoring to detect malicious programs running on machines. The verdict of this Bullguard review: good, although certainly not outstanding, protection. As for the scanning and removal tools: these also performed satisfactorily during our test of the program. Although the installation time (we timed setup at 7 minutes and 30 seconds) was a little on the slow side compared to the competition, once the program was up and running it proved quick and capable at running system scans. Users have the option to launch quick, full, and custom scans. The performance for all the available options is consistently good. The quick scans runs in under two minutes while the full scan, on the test machine, completed in just under 5 minutes. 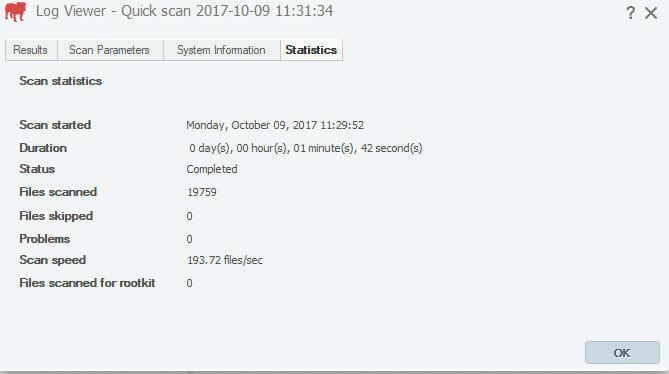 We were also impressed by the fact that the quick scan did not seem to miss any test antiviruses (although those wanting thorough protection would naturally be advised to run the full version). ‘Custom’ scans are limited in their customization to simply selecting a directory to be scanned while offending files are quarantined into a well-designed quarantine table from which users can chose to restore or delete them. For those concerned with detecting viruses received by emails, the product contains a very capable spam filter that automatically integrates with Mozillla Thunderbird, Outlook, Windows Mail, and Windows Live Mail. Although the number of home users accessing their inboxes through desktop clients has certainly plummeted in recent years, those that still check mail this way will be pleased to have such a reliable solution on their side and integration with the open-source Thunderbird is an added plus. During our test, no genuine emails were blocked while several junk messages were successfully intercepted. 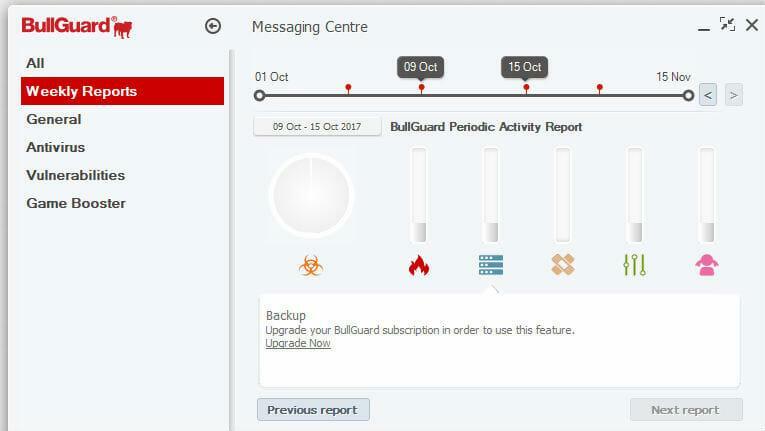 Bullguard’s firewall is available with both Bullguard Internet Security and Bullguard Premium Protection. 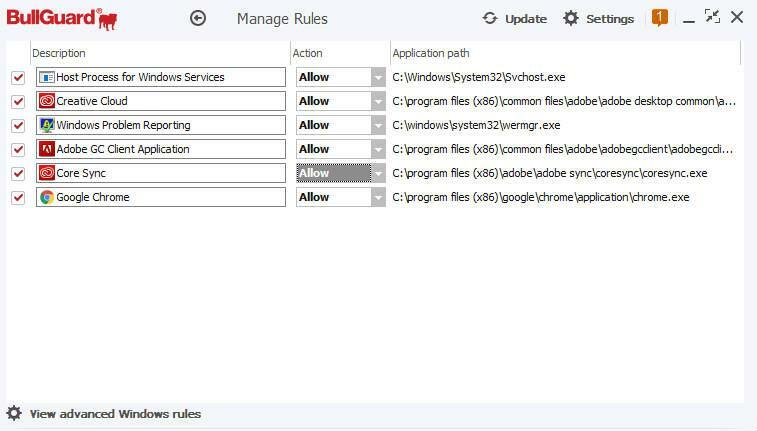 The firewall can comfortably handle basic rule configurations (these, in fact, are automatically populated based on detected programs) but redirects to Windows’ native manager for those requiring more granular configurations. 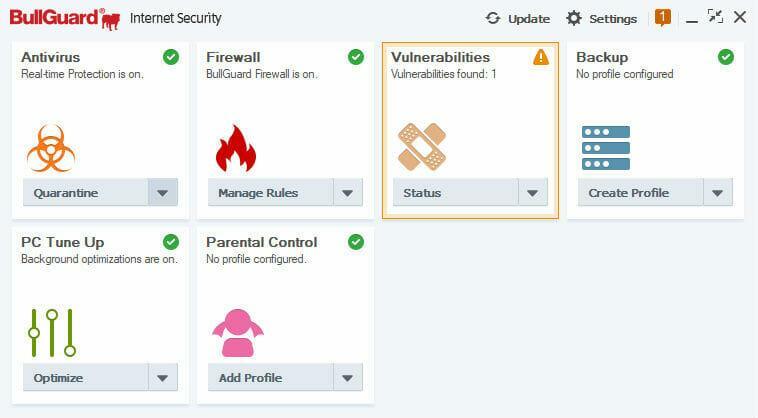 As an added bonus, the firewall integrates deep into the system registry, preventing deep system exploits to hijack the program and introduce viruses and successfully flagged both legitimate and illegitimate outbound traffic requests on our test system. Overall, although the firewall passes the baton back to Windows for those requiring advanced rule setup (and the fact that users have to rely on auto-detected programs is a drawback), it manages to provide reliable functionality. 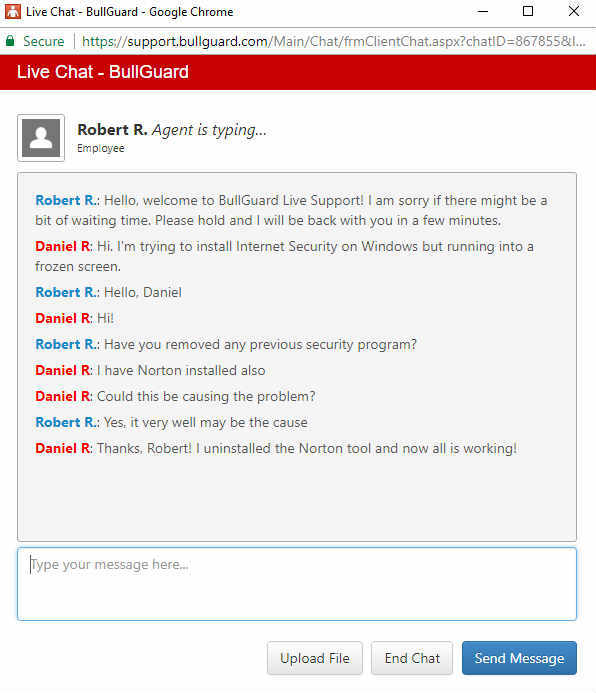 Like most solutions on the market, Bullguard antivirus is not difficult to set up. Users concerned with privacy will also appreciate the fact that the executables can be downloaded on a trial basis from the website without the need to complete a single registration form. One negative that held true for all three of the products we tested was a somewhat lengthier-than-usual initial setup due to download antivirus definitions. 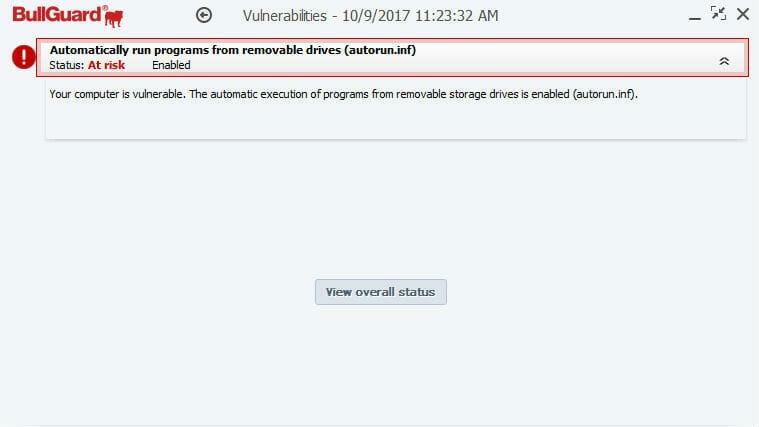 Although this is a one-time delay, this did mean that setting up the tool took longer than other programs we installed. 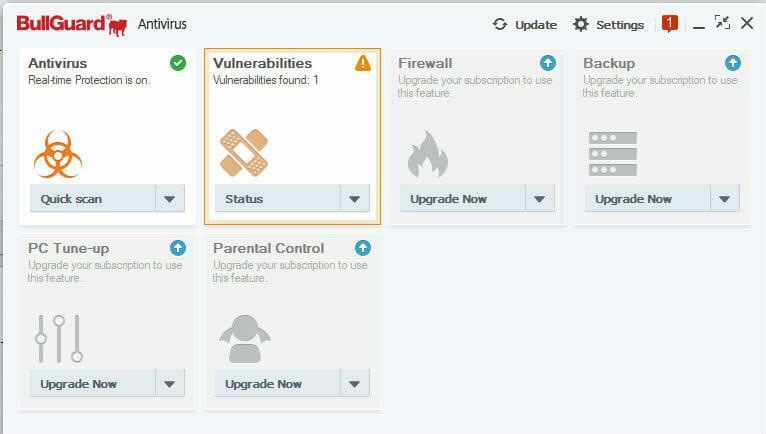 One area in which Bullguard deserves top marks is its well-designed user interface. 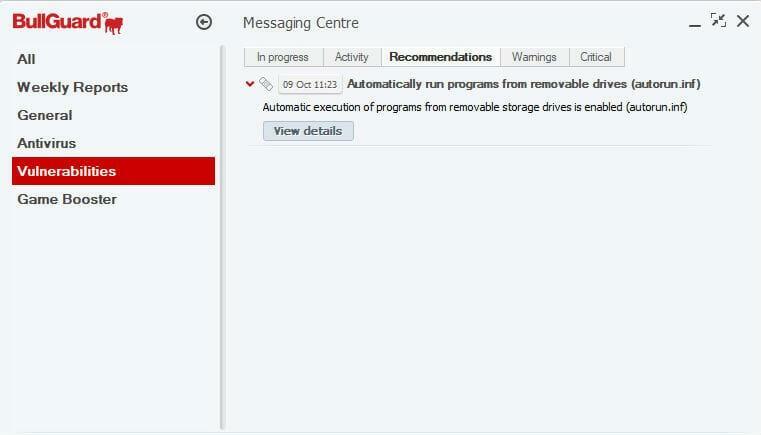 Neither the notification popups nor the main programs menus felt cluttered or overly intrusive during both normal use and active testing. Thought has clearly gone into ensuring that users can benefit from the system’s relatively straightforward functionalities which provide a perfect visual complement to the program’s philosophy of providing simple but effective antivirus tools. In addition, the same user interface is used for all three of the company’s products (if functionalities aren’t available in a certain version, they are simply grayed out). Delivering a consistent user experience across product levels is a marketing and UI tool that competitor solutions should take note of. How does Bullguard fare when users begin running into hitches? 24/7 support is available across all three premium product lines by both live chat and email. Telephone support, however, is not available. In addition, the company maintains a comprehensive online knowledge center for ironing out the most common usage issues. During our test chat with representative Robert, our query was dealt with courteously and professionally in less than two minutes. Overall, the level of support offered is good, but telephone availability would be a nice addition to put Bullguard on par with the top-tier providers.